Listing presentations are won when you can simultaneously prove your work and overcome objections. 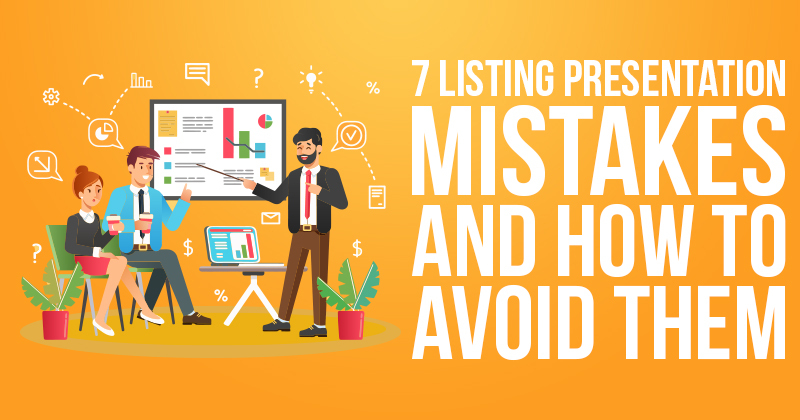 Here are 7 listing presentation mistakes and how to avoid them. This can happen when either spouse is at work or a parent is busy taking care of young children. It’s great if you get one person to buy into your pitch and want to work with you. The problem is you only won over one person, and you're leaving it up to the person you did speak with to remember and sell the other. The other decision-maker may have different ideas when it comes to listing their home with an agent. Don’t make your full and final pitch until everyone with any type of say is present. When you leave your pitch up to another person to relay, your best selling points may get lost in translation. You don’t want to depend on someone else to sell their significant other on you. This may work out if the owner is really enthralled with your past listings and sales, but it’s not a risk you want to take. That's not to say you can't court or pursue individual homeowners at first, but you should avoid giving your longest and most aggressive pitches to one person. Chances are, the homeowner will say he or she can’t make a decision until his or her significant other is brought up to speed. When you're setting up a meeting, you don’t have to be subtle when you ask if each decision-maker will be available. Tell them your presentation is meant to be heard by each resident at the same time. People will understand and make an effort to meet you at a time that works for everyone involved. The misconception about listing presentations is that you are there to sell yourself. While you are showing a homeowner what you can do, your real focus should be on what you can do for them. Most agents sit in front of homeowners and talk about how great they are. They talk about how many homes they’ve sold and how great their marketing is. The problem with this approach is that it doesn’t make it easy for homeowners to imagine themselves working with you and addressing their individual concerns. Instead of focusing on yourself, talk about how your marketing and knowledge can work for their particular home sale. Paint a picture of how working with you will guarantee a stress-free, quick, and profitable sale. Show your past sales to back up your talking points, but don’t boast too much or make the presentation all about you. Keep the focus on the homeowner and their home. If you load up your presentation with a lot of graphs, pictures, charts or videos, you may overwhelm the homeowners. You don't want the people you're selling to to become distracted away from what you're selling them. You need to find a balance between keeping your audience engaged in your presentation and overloading them with too much visual information. This is that same balance I just mentioned. If you have too many numbers in your presentation or a lot of written-out data, your presentation is guaranteed to be a snore. Find a way to include your most important CMA statistics and use them in simple charts or graphs. People don't want to be overwhelmed by visuals, but they also don't want to sit through a text-heavy presentation. Does the thought of designing a listing presentation stress you out? Our MyBooks members have access to our Easy-Close Listing Presentation, which can be customized for your individual business. Our presentation is professional and visually engaging, and covers important talking points guaranteed to help you seal the deal. Most agents know how they’ll handle certain homeowner objections. But scenarios don't always play out exactly how you plan in the actual moment. If you stumble even for a few seconds or your answer isn’t 100% clear, you can easily destroy a homeowner's faith in your knowledge and ability to sell their home. Any response that creates a type of resistance is a response you should avoid — for instance, "no" can be very polarizing. Fully explaining yourself without outright saying "no" is the best practice. The best objection responses are ones that fully answer the intent of the questions and lead the homeowner to a more positive topic of conversation. The best way to make sure you have a foolproof response to common objections is to practice them over and over again — preferably, with other people around. Ask a co-workers or family member to play the role of the homeowner. Study your responses as much as your listing presentation. Your responses won’t be the same for every situation, but having a great handle on how you generally want to respond to different questions will ensure your a smoother presentation in real time. The most successful Realtors can pitch to the youngest homeowner and the oldest homeowners with the same charisma and get the same message across. You have to be versatile in your sales pitches. The same delivery won’t work for every homeowner. Obviously, someone in their 50s responds to a different style of communication than someone in their 20s. Not only that, but one 30-year-old could have a completely different style of communication than another 30-year-old. Age isn’t the only factor that determines how a presentation should be delivered. Some people want to be persuaded emotionally, while others are driven by statistics and numbers. Others want to hear about your past successes, and others want to know what you'll do to specifically advertise their home. Picking up on how people communicate is key here. Pay attention to how the homeowner responds to different things you tell them before your listing presentation. If you go through a list of comparable sales and it seems to lose their interest or their enthusiasm, craft your presentation around a more emotional pitch. Once you start looking for signs, they become easier to recognize. There’s really no reason to mention anyone else when you give a presentation. Don’t craft your presentation around comparing yourself to other agents or talk about how anyone else markets their listings. Most importantly, never throw another agent under the bus and insult their work. Smear tactics won't win you listings, nor will they garner you any respect. This is especially important to keep in mind when you're approaching expired homeowners. If the homeowner starts bashing their previous agent or agents, refocus the conversation to talk about what you will do for them, not about what the previous agent did wrong. You can point out why the listing may have failed, but don’t mention anything personal about the agent's abilities or tactics. After you give your pitch and leave, homeowners might remember what you said. But when you leave behind something of value, like a helpful book on home-selling, they have something physical to associate with you and what you can offer. That’s what our MyBooks membership offers. Books hold inherent value and aren't likely to be thrown away. Even if you don't immediately land the listing, your book will sit on their shelf and they might just call you up later on when they finally decide to sell or things don't work out with another agent. Learn more about our program here. Need more proof this strategy works? 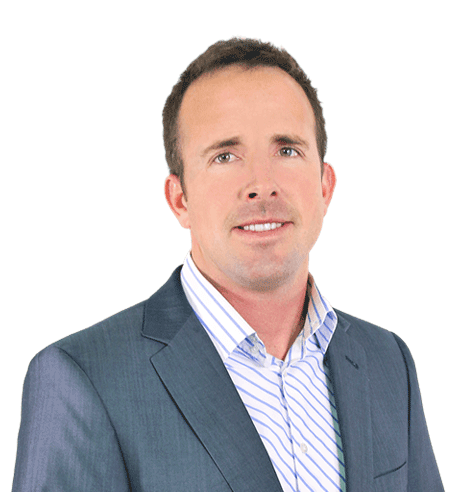 See how Mark doubled his close rate on listing presentations just by bringing along his book! Until next time, keep working smarter!